As a gunman stormed into the Al Noor mosque firing indiscriminately at worshippers, Husna Ahmed had one priority - getting the women and children to safety. “Hold your children, come this way,” she screamed as she led the group out a side door and through a gate away from the storm of bullets and carnage behind them. Once sure they were out of harm’s way, Husna returned inside to help her wheelchair-bound husband. 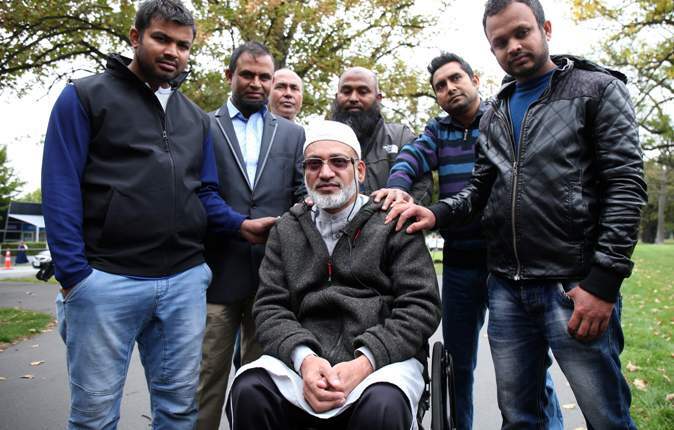 Farid Ahmed was hit by a drunk driver six years ago and was left paralysed. Husna knew he had no way of escaping the shooter and was desperate to reach him, to help him get away. As she made her way back into the mosque, she was shot from behind and killed. Inside, Farid thought he was the one who would be killed. “It was a horrible scene … I saw blood, I saw people injured, I saw dead bodies, people in panic,” he told the Herald today. Farid was in a side room and could not see the gunman, but he could hear shot after shot, screams of sheer terror. Windows were smashed and people started clambering out. Farid then saw a gap in the terrified crowd and decided to try and wheel himself out. From his hiding place Farid kept an eye on the door he thought the women and children would come from. No one came and he was confident his wife would have stepped up to lead them out, that they would be safe. He had no idea that she was lying dead on the other side of the mosque. After about 10 minutes, Farid was sure the shooting was over. “I had a feeling that probably, he had done his job,” he said. He and another worshipper decided to go back inside. “It was probably a stupid thing to do, but I could not think any other way at the time,” he explained. Farid came to New Zealand in 1988 and Husna in 1994. They married the day she arrived in Auckland and moved to Nelson that week. They moved back to Auckland after Farid’s accident and he trained in homeopathy. “She had a wonderful personality,” he said. Farid was still reeling from the ‘calculated’ attack that has ended at least 50 lives. But he was determined not to let it destroy his life. “You cannot turn the clock back, but what we can do from now is we can either beat ourselves and suffer, or turn around and turn this experience into a better future,” he said. Farid said he did not, and could not hate the gunman. In fact, extraordinarily, he has forgiven the alleged mass murderer. “I was asked how ‘do you feel about the person who killed your wife?’” and I said “I love that person because he is a human, a brother of mine,” he said. Farid said On Sunday night when he could not sleep his thoughts turned to the gunman.